Folklore, fairies and demonic spirits in the sceptical 17th century. A pamphlet circulated in 1696 that told the story of a 19-year-old domestic servant, Ann Jeffries, who, while knitting in the garden, encountered ‘six Persons of a small Stature, all clothed in green, which she call’d Fairies’. The story was written and published by Moses Pitt, a London-based printer and bookseller. Jeffries had been employed by Pitt’s family at the time of the event, which was dated to ‘the Year 1645’. The publication was in parts a personal reflection of a mysterious event that had occurred during Jeffries’ childhood. However, it is also indicative of the complex and capricious nature of fairy belief in the late 17th century, at a time when political opinion was divided between strict Christian orthodoxy and the increasing scepticism of the natural world. Belief in fairies, while arguably not as problematic as communicating with other mythical spirits, came under attack during the English Protestant Reformation. Where medieval fairies were mischievous, lovable and occasionally unpredictable, the fairies of the 16th century were far more dangerous creatures. As with many superstitious or magical practices, Protestant officials correlated the belief in fairies with maleficium and the devil. The Elizabethan preacher Edmond Bicknoll argued in 1579 that the purpose of ‘Fayries, and suche other fancies’ was to ‘cast of the spirite of grace’ so that the Devil will forever be ‘the terrour of our conscience’. James I contended in his Daemonologie (1597) that ‘the Devils conversing in the earth’ could be divided into four categories, including ‘these kinde of spirites that are called vulgarlie the Fayrie’. Similarly, the poet Thomas Washbourne described in 1654 that after ‘the Puck had led [him] round’, he had chosen ‘the Devil’s track, not God’s’. 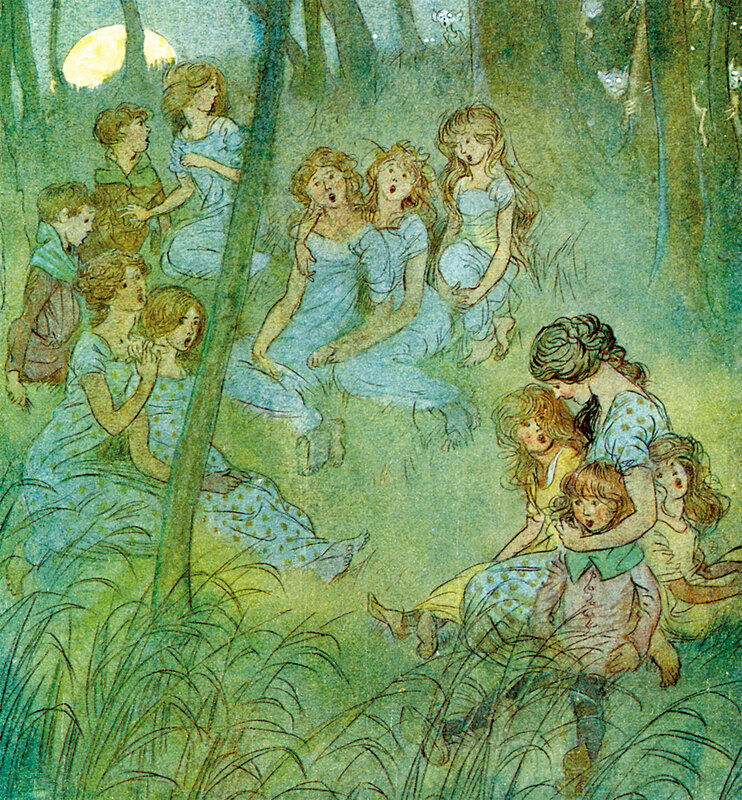 The concept of fairies as inherently evil beings, capable of causing terrible misfortune as a result of their collusion with the devil, is evident in Jeffries’ case. Pitt described how, on meeting the fairies, Jeffries ‘fell into a kind of a Convulsion-fit’ which left her ‘so very sick that she could not … stand on her Feet’. The Protestant understanding that fairies could enter the mind to corrupt the soul had certainly permeated popular belief by the 17th century, drawing parallels between medieval folk tales and contemporary fears of the devil. Similar cases, such as the story of a convicted Scottish witch named Issobell Haldane, who was taken unwell after a visit from the ‘ffarye-folk’ in 1623, were consistently reported in the cheap prints. Later, in 1677, the doctor John Webster diagnosed the cause of ‘fairy-taken’ illnesses as ‘Ignorance, Popery, and superstition’, as well as a weak religious and moral conviction. As a young, unmarried woman, Jeffries was perceived as a likely victim of the devil due to her vulnerability. The significance of gender in this case is also apparent in the second part of the tale. After Jeffries recovered from her illness, she suddenly acquired the ability to heal using potions and charms, reflecting the role of a medieval cunning woman or, more poignantly, a witch. She also refused to eat for a sustained period and was, instead, ‘fed by these Fairies from that Harvest-time to the next Christmas-day’ with fairy bread, which she also gave to a young Pitt while he was in her care. The dependence on evil spirits and the use of magical charms was forbidden in the 17th century, both in secular and ecclesiastical belief, as an act of witchcraft. Between 1572 and 1716, for example, there were at least 39 Scottish trials that specifically condemned the communication with fairies or ‘fays’ as an act of maleficium, the punishment for which was cruel, ranging from flogging or banishment to execution. It is unsurprising, then, that Jeffries’ powers and ‘the Stories she told of these Fairies’ alerted the legal authorities, who tried to persuade the family that she was under the ‘Delusion of the Devil’. Fortunately for Jeffries, however, the family was not convinced by this argument. As Pitt wrote: ‘She did no Hurt, but Good to all that came to her’ as she healed the sick and cared for their home. The family’s determination to protect Jeffries, despite the repercussions of her actions, illustrates the inconsistencies in contemporary understanding of the nature of spirits. The court, which had previously condemned people for similar crimes, failed to convict Jeffries and she was freed without charge. The case of Ann Jeffries is significant for many reasons. It shows that, despite the constant attack on the origin of spirits by Protestant theologians and legal authorities, in the late 17th century there remained discrepancies in popular understanding. Fairies were evil creatures with the capability to harm thanks to their collusion with the devil and a diabolical remnant of the Catholic past, but they could also bring good fortune to those they encountered and bestow gifts of healing, food and magic. Furthermore, in the 1690s, when religion dominated and divided political opinion, the pamphlet can be seen as a reaction against the increasing popularity of atheism and disbelief in the aftermath of the Civil Wars (1642-51) and the Glorious Revolution (1688). Pitt presents the case as evidence of the ‘great and marvellous works’ of an interventionist God, emphasising the Protestant doctrine of Providence. As a result, the pamphlet challenges the hostile attitude towards religion, to suggest that fairies, miracles and folk tales, still had an important place within an increasingly sceptical society. Abigail Sparkes is a recent MA graduate in Early Modern History at the University of Birmingham.